Saturday, August 17 at 4:00 p.m. 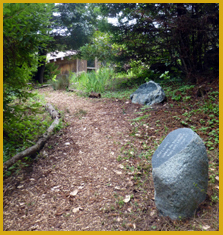 The Haiku Stone Path, the newest project on the Gualala Arts Center grounds, will be inaugurated on Saturday, August 17 at 4 p.m. as a part of 52nd Annual Art in the Redwoods Festival, with haiku readings by Laura Leigh and shakuhachi music by Karl Young. Engraving poetry on stones is very popular all over Japan. There are several thousand in Tokyo alone. As far as I know, the only two such haiku stone paths outside of Japan are the Katikati New Zealand, in New Zealand and now this one in Gualala, California. Since seeing the poem stones in Japan I had the dream of having one in Gualala. In 2007, after the Collaboration Show, Sus had invited me to put my part of that exhibit on a platform down on the trail in the woods between the arts center and the Gualala River. Every time I walked the trail, I kept seeing stones with haiku engraved on them along the path. For the 50th anniversary of Gualala Arts, Sus and I discussed making the haiku stone path part of that celebration, but we could not find the beautiful river stones in my vision. As soon as I saw one of Art Horvath's stones on the porch of Gualala Arts Center in February, 2013, the whole idea began to come together. I have deep heartfelt thanks to Sus Susalla for encouraging my dream, the hours of discussion, and for introducing Art to me. Many thanks to Art for all the emails and the tour of his Ideal Quarry by computer. Huge thanks to the Art Dryer and the Grounds Crew at Gualala Arts for accepting the idea of the project and then heaving the stones into place. Peter Mullins, when I have a big moving job, you will be my go-to person. I am very happy to see this dream come true and look forward to many more stones from the haiku writers of this very special area.. Page Copyright © Jane Reichhold - 2013. Photos Copyright David Sus Susalla 2013.